In 1907, the lighthouse at Pachena Point in British Columbia was constructed, and first lit in 1909. It was built after a ship, the Valencia, shipwrecked on its shores. The wreck was one of the worst in maritime history, and earned the waters that it went down in the name «Graveyard of the Pacific». The lighthouse has heritage status, and is still operational. Near the end of 2007, Canada Post released a definitive of the stamp, but unfortunately, the image of the lighthouse was inverted! When looking towards the ocean, the lighthouse is to the left of the lightkeeper’s home, but on the stamp, it is on the right.Who better to notice the mistake and alert people but former lighthouse keeper Iain Colquhoun! 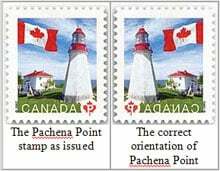 Once the mistake came to light, Canada Post said that it would not recall any of the stamps, but simply issue the new one once the current run of printing had ended. It is estimated that the cost of correcting the error would be $10 000.00, which is less than the cost of recalling the stamps. It is expected that the corrected stamp will be available in late spring, or early summer 2008. Carmen, you better keep your job. They are very common and hardly worth more than face value. By the way, thanks for a great blog and website. I’ve just become a new subscriber to your approval series and ordered some new supplies. I’ve even give you some free advertising in my own blog! Feel free to go have a read!